Some phrases just get stuck in your head. When I opened my prize box from the CSA this week, and saw a lovely rosy bunch of radishes, all I could think of was “delicious radish relish.” It’s a line from a poem by Calef Brown, a wonderful poet and illustrator – he’s a very refreshing pickle in the often saccharine and derivative world of children’s books. The poem, Clementown, describes a town where everybody is greenish, and tall and leanish, and the dogs bark loudish. 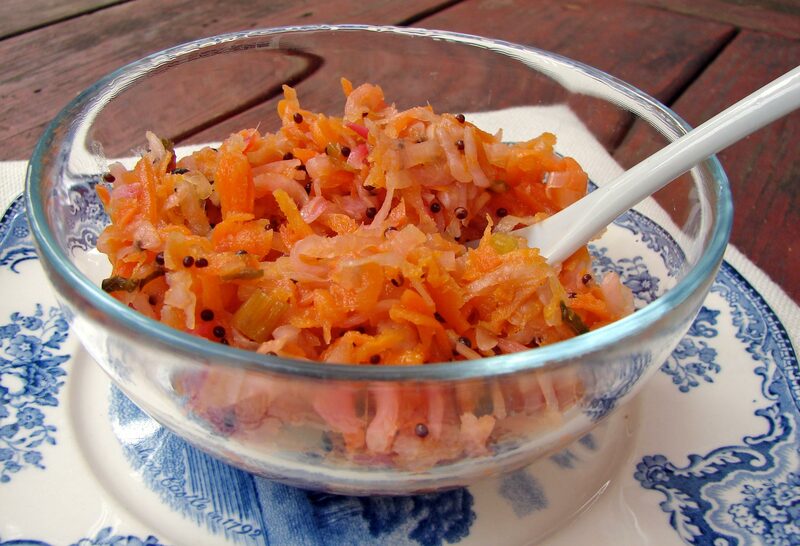 All of the people eat reddish food, like delicious radish relish. You can hear Daniel Pinkwater reading the poem here. Well, I set about to make some delicious radish relish (if you make this, and serve it to friends or family, you’ll be required to refer to it as “delicious” radish relish). I consulted my mennonite cookbook, for tips on pickles, chutneys and relishes. Well! They put up pounds and pounds of vegetables in pickle or relish form. We didn’t have that quantity of radishes, here at The Ordinary. We did observe that every recipe called for sugar and vinegar, so we decided definitively that if we incorporated sugar and vinegar with our radishes, we’d have a relish. We decided to add carrots for sweetness, garlic and scallions for savoriness, ginger and mustard seeds for their gentle bite, red pepper flakes for heat, and fresh basil, because it’s mother-flipping delicious in everything. When we sat down to eat yesterday, Isaac had a little fit. He didn’t want to eat his chard and olive tart (I’ll tell you about it later!). David, who has heretofore never been a big fan or radishes, told him that he was scared to try delicious radish relish, but he’d done it anyway, and he’d found it … DELICIOUS!! While I’m at it, I’ll also briefly mention a salad we ate last night, because it was easy, and also delicious. We’d gotten some lovely, thin, flavorful reddish lettuces from the farm. They looked like they might be bitter, but they were actually quite sweet. I put a giant mound of them in a bowl, tossed it lightly with balsamic and olive oil, salt and pepper. Then I grated a fair amount of sharp cheddar on top. 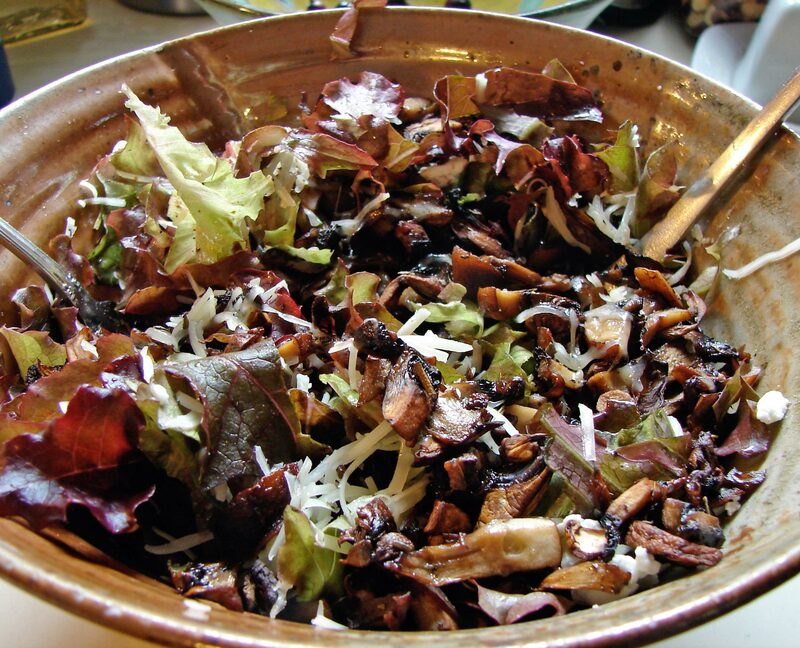 I added some still-warm roasted mushrooms, and they melted the cheese and wilted the lettuce just the tiniest bit. I added a ton more freshly ground pepper. Easy and delicious!! Here’s a lovely version of Clementown by what appears to be a Calef Brown tribute band called…Clementown!! Warm the olive oil in a large frying pan over medium heat. Add the mustard seeds, garlic and red pepper flakes. Cook till the garlic starts to brown and the mustard seeds pop and sizzle. Add the scallions and ginger. Cook a minute or two. Add the vinegar and sugar, and cook till the mixture is hot and bubbly – add the carrots and radishes. Stir so they’re coated. Cover and cook for a few minutes, till the carrots and radishes are just wilted and translucent (that would be the radishes!) but still bright and full of life. The pan should be fairly dry, not too saucy. Stir in the basil, season with salt and pepper, cook about 1/2 minute more, and then remove from the heat. Cover and let cool. This entry was posted in recipe, vegetable side dish and tagged basil, carrot relish, ginger, pickle, radish relish, scallions by Claire. Bookmark the permalink.